After a break of a few weeks I have been baking again, making new advance through the bread book "Hjemmebagt". And I am getting closer and closer to have made 1/3 of all the recipes :-) And in the coming two weeks I will be baking some more breads from this wonderful bread book, as I am having some guest coming around for dinner entertainment. 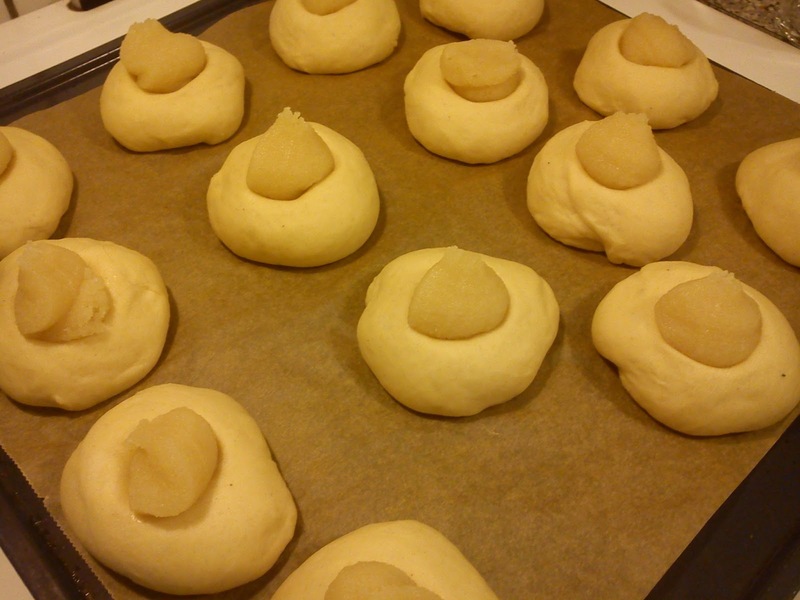 From the beginning I decided to change the shape of the bread from wreath-shape into a combination of buns and a single bread, which would be fitting better with my upcoming bread demand. 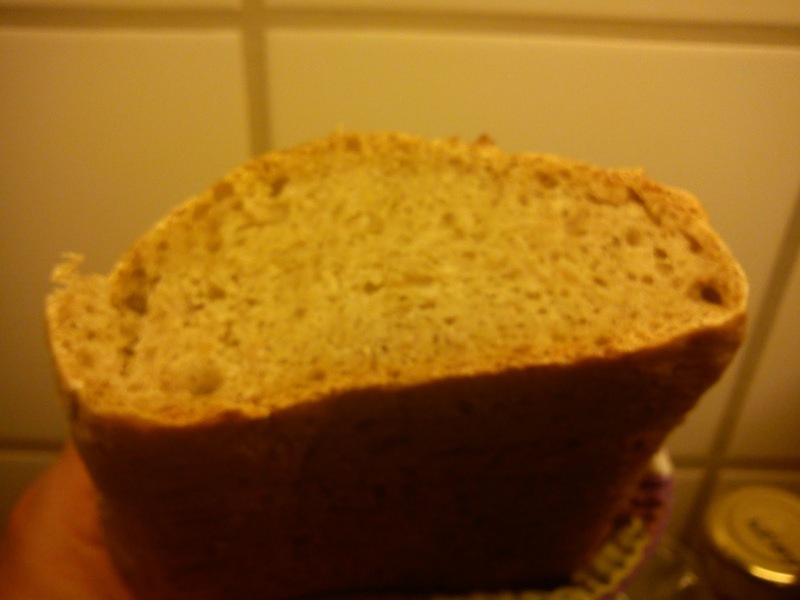 The bread is made up from rye flour, wheat flour, rye kinks, water, olive oil, salt, beer and off cause yeast. You beging by boiling the rye kinks in the water for a few minutes and them let cool down, before you start to knead the rest of the ingredients together. The use of beer is giving a nice taste to the bread, and the rye kinks can not be felt as hard particles, but they are giving a good mouthfeel to the final bread. I have found this recipe on risotto with tomatoes. 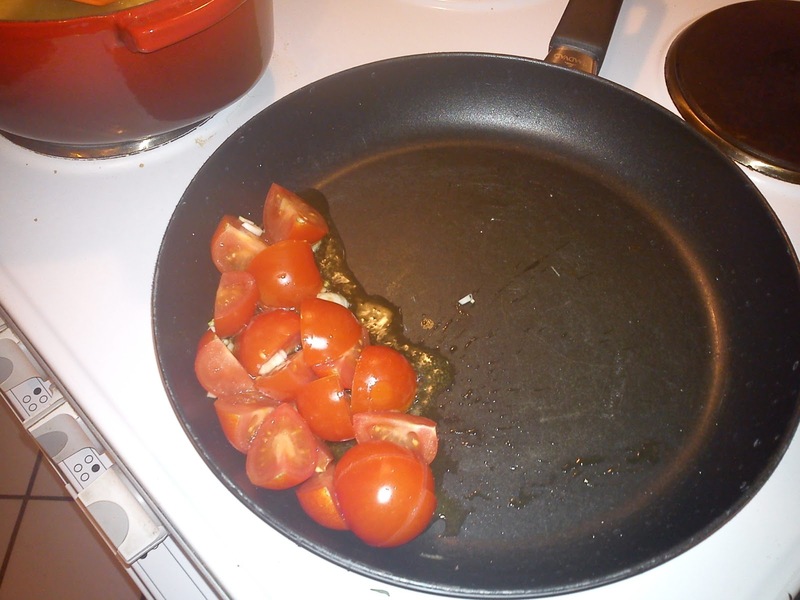 In the original recipe the tomatoes are cherry tomatoes, which is not cut into quarters, before frying them on a fan. But the tomatoes in my kitchen was approx 2-3 times the size of cherry tomatoes, so I decided to cut them in quarters, before frying them. It was quiet tricky to taste the saffron, so either leave it out of the recipe or increase the amount of saffron strings. Wet the saffron strings in the white wine. Heat up the butter in a cooking pot. Add the onion and and fry it for 2-3 minutes. Meanwhile heat the olive oil on a frying pan, add the garlic and tomatoes, and let it cook softly for 5-10 minutes. 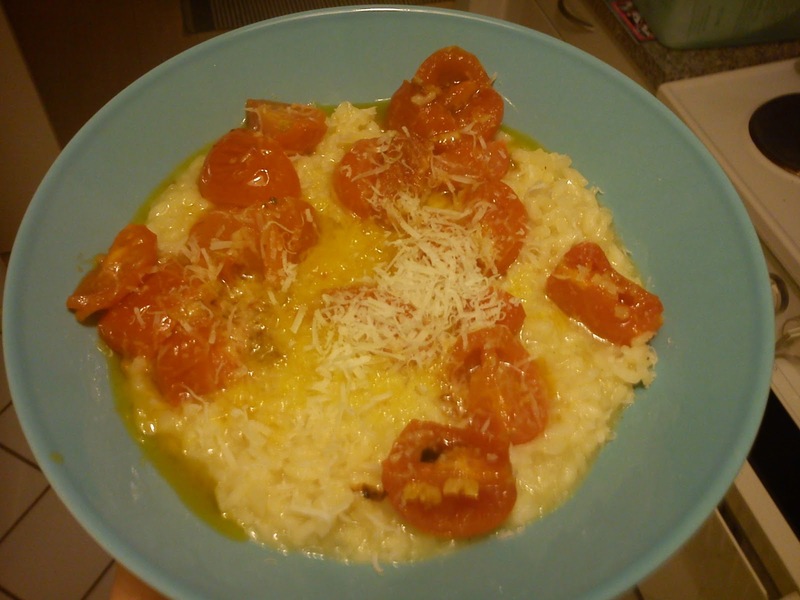 Add the warm tomatoes, garlic and grated Parmesan cheese on top of the risotto in a serving plat. 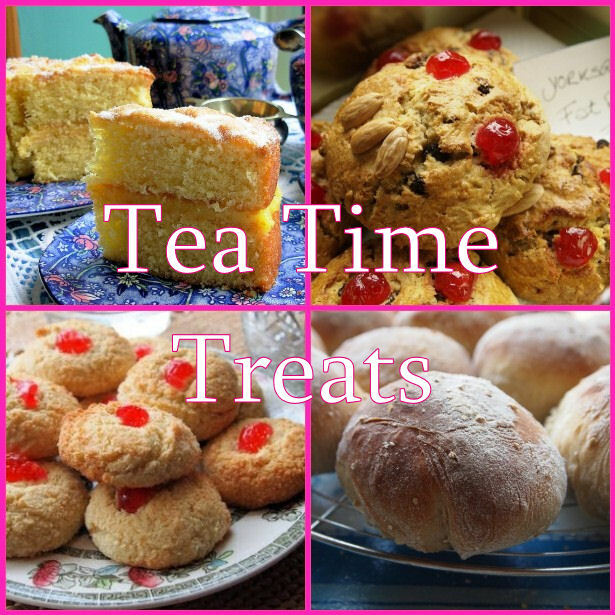 This monthly Tea Time Treat have been something of a challenge for me !!! Here in February it is Kate from What Kate Baked (being the hostess of the virtual tea table), and she selected Perfect Puddings as the theme. What is pudding for me ? I connect pudding with a Dr. Okter powder, which you some how turn in to a vanilla pudding or chocolate pudding !!!!! Or even verse, you cut open a ready-to-eat UHT carton with pudding inside. So this theme did not bring me any positive thoughts at all. 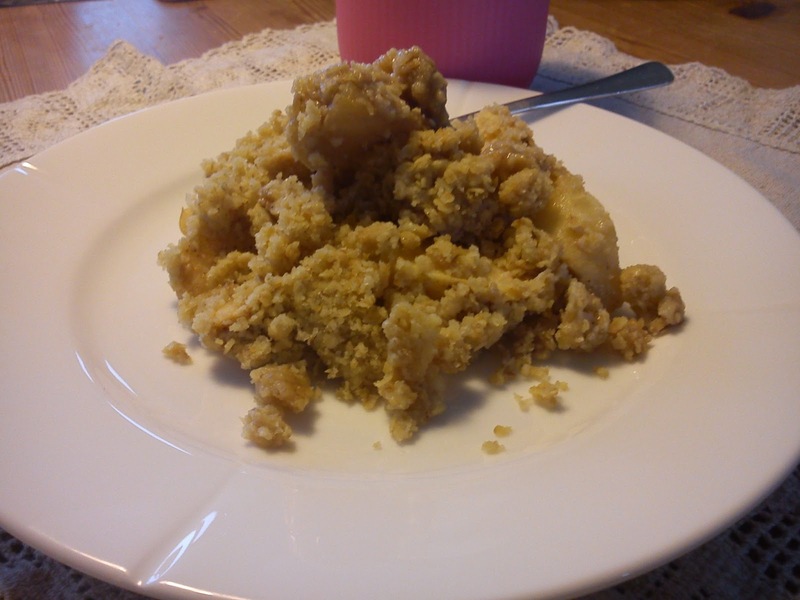 However, I looked at Kate´s contribution for the virtual tea table and so that she had made a crumble. 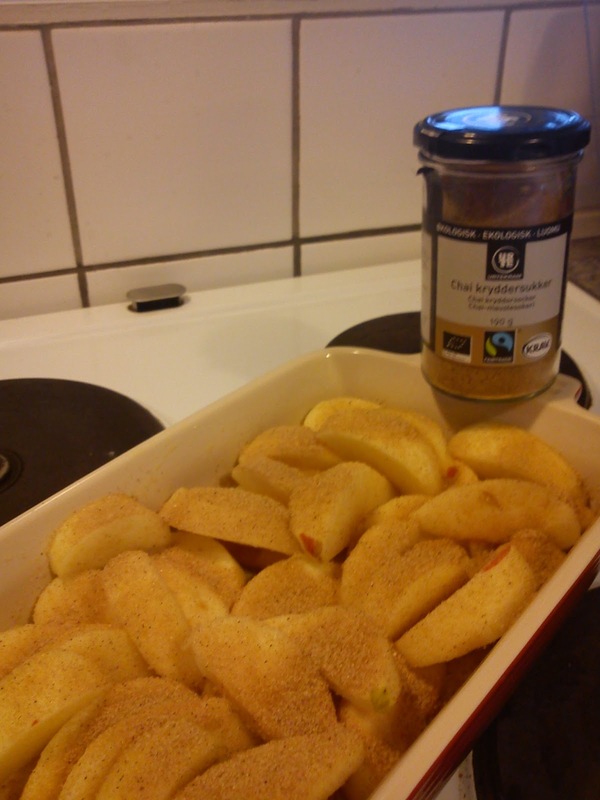 So I decided to make a crumble as well using a copy of a recipe, which I have got from a very good girl friend, exchanging the use of cinnamon with Chai sugar. 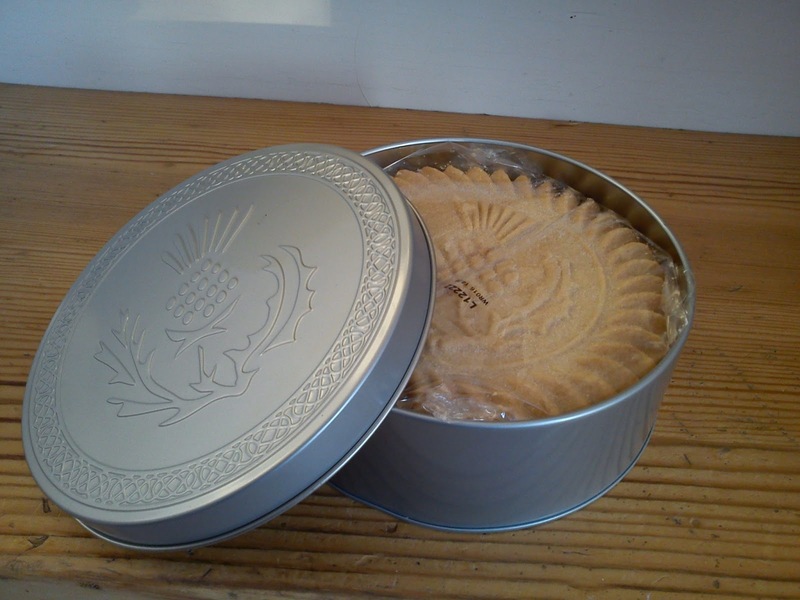 Covered a baking tray with butter or oil. Start by filling the baking tray with the apple pieces. Cover the apple pieces with the Chai sugar. 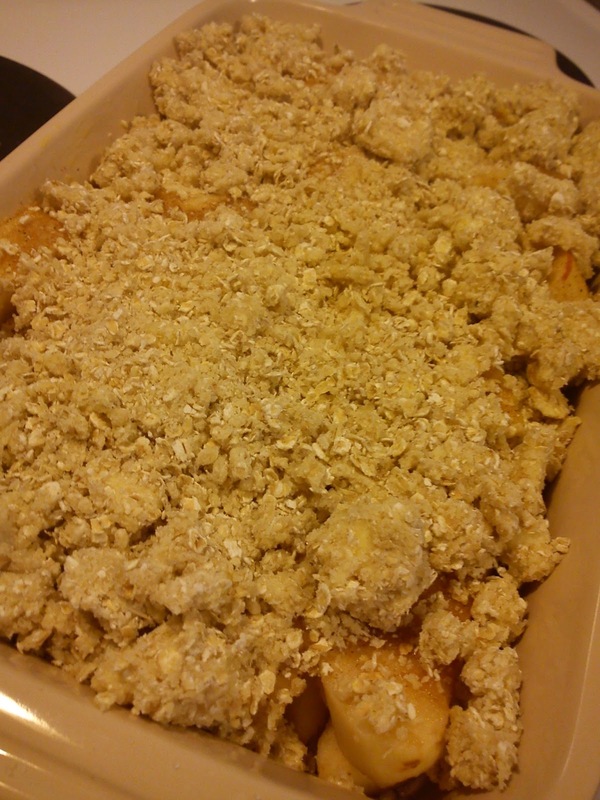 Mix the rest of the ingredients into a crumble layer, do not mix for too long, as it should maintain a crumble structure. 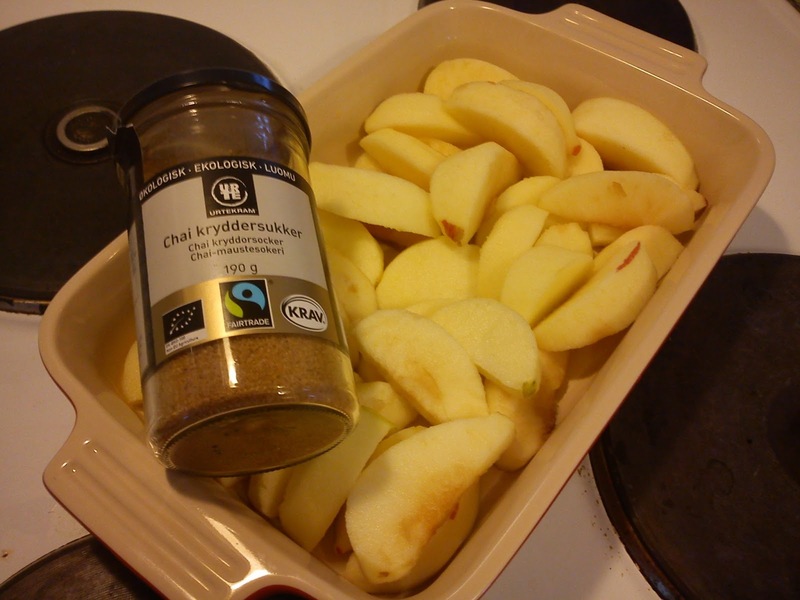 Distribute the crumble mix on top of the apple. 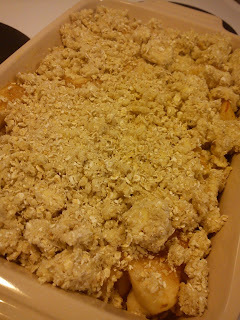 Bake the apple crumble at 200'C for 30 minutes. Cool and eat it as it is or serve the apple crumble together with whipped cream, sour cream or ice cream. 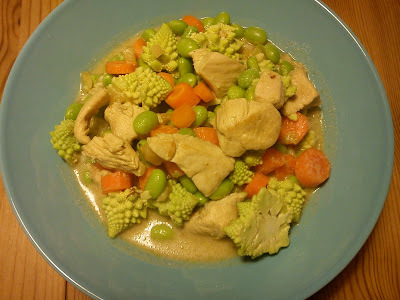 Ever since I have been living in the England, I have been a big fan of a good curry with medium strength of spiciness. 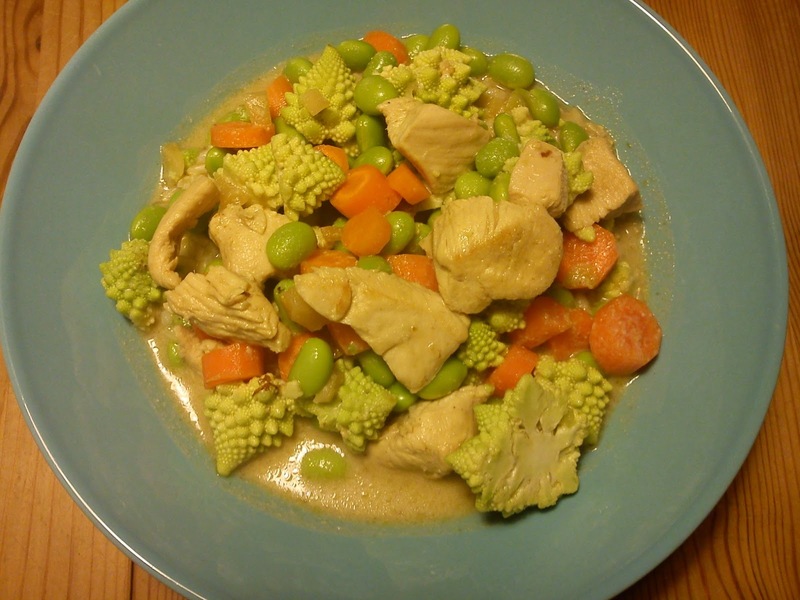 And making a curry allows you to "get ride" of various vegetable left-overs in your refrigerator in a delicious tasty way. I have found this recipe in weekly newsletter issue 1/2013 from Årstiderne. 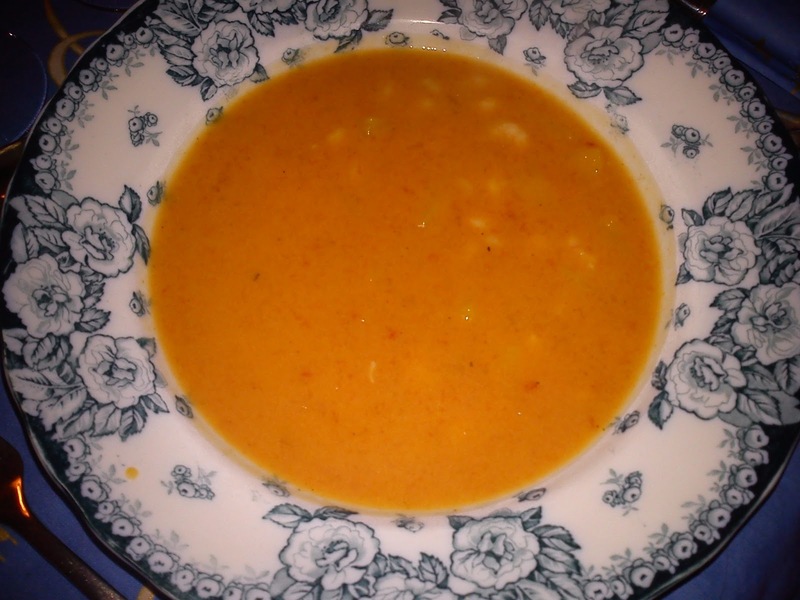 I have changed the beans from the plains (which I really dislike) into Edam beans and added into some carrots to get some colour in this curry. Heat up the oil in a large cooking pot. Fry the chicken chunks. 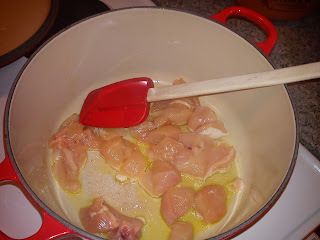 Add the curry paste and let it fry together with the chicken for a short period. 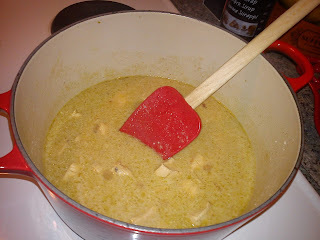 Add the syrup, ginger and ginger syrup and coconut milk, let it simmer for 15-20 minutes. 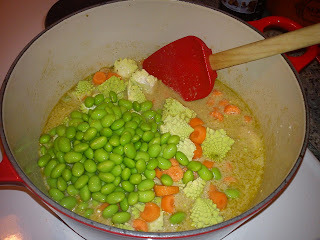 Afterwards add the romanesco, Edan beans and carrots, and let simmer for another 5 minutes. How come, that I always "get voted out" as neither the very first or the very second person in the various cake competition as work ??????? Whether it is Danish Idol (X Factor) or Strictly Ballroom (Vild med dans) I always get the first or second person , which is voted out !!!! And we actually draw lots for the participants !!!! I simply do not understand it !!!!! For any upcoming cake competition I will seriously consider to contact "my unlucky" participant to inform he/she, that he/she will not last long in what ever competition they are competing. I have located this brownie recipe in the latest issue of Isabellas issue 01/2013. 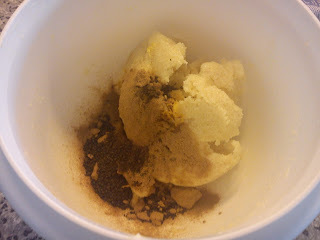 And I have made two modification by adding in vanilla sugar and some salt. 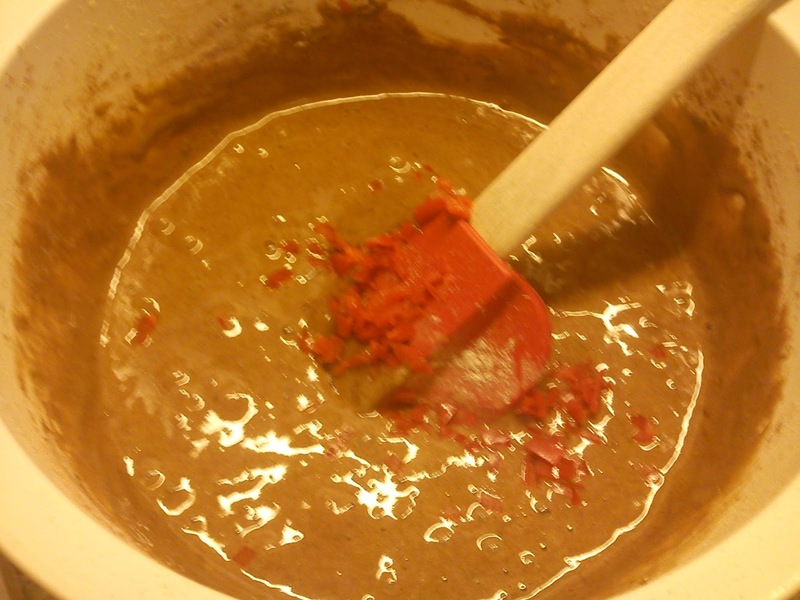 Melt the butter and dark chocolate together in a small cooking pot. Whip eggs, sugar and vanilla sugar together into a fluffy mass. 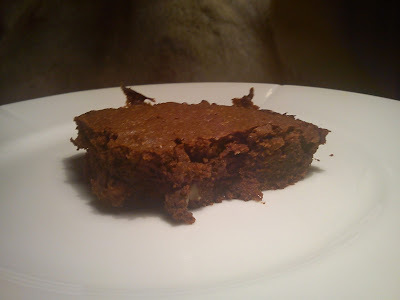 Gently mix in the flour, salt and cocoa powder in the egg-sugar mass. Afterwards add in the chilii, pistacios and walnuts. End by adding the melted butter-chocolate. Add the cake mass in a form of 20x30 cm baking tray covered in baking paper. 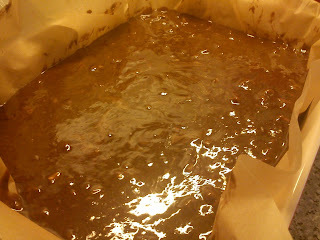 Bake the cake at 200'C in the middle of the oven (conventional) for 30 minutes. Wednesday after work a good girl friend and I went to Trapholt Museum located in Kolding. This museum is having late open Wednesday evening combined with free entrance after 17.00. Right here and now there is a special exhibition called En dronning og hendes familie (A queen and her family) covering various portraits of the Danish queen and the rest of the royal family, which we wanted to see before it is closing 24 February 2013. This special exhibition is actually quiet good, so if you are in the neighbourhood I would recommend you to go there. 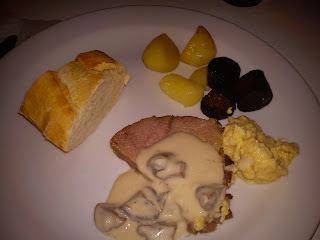 Anyway we decided to eat our evening meal at Cafe Beck at the museum, where an evening buffet is served every Wednesday evening. There was many different both cold and warm dished incl some great bread, apple cake made from apple pure with whipped cream on the top, cheese selection etc. So we were both full after having a broad selection of the dishes. The price for the evening buffet is 185 DKK/person, which a medium price level. Taking inspiration from this Valentine sparkling cocktail in mind, I made the following twist: maintain the rose extract as flowers is a typical Valentine gift, adding some Cointreau for the fun of it and finally putting in some cranberry juice in order to get a more reddish colour (red being the colour of love) and at the same time making the sweetness of this cocktail more refreshing. With these Valentine cookies I am giving these cookies with ginger and white chocolate my translation of Valentine Day. The buisness aspect of Valentine Day is buying roses and chocolate to your love according to the commercials !!!! I have translated this into: love (pomegranate kernels having the shape of a heart), chocolate (pieces of white chocolate) and roses (rose extract). Add the egg and rose extract into the butter-egg mass and whip again. Add flour, oat flakes, baking powder and salt into the cookie dough. 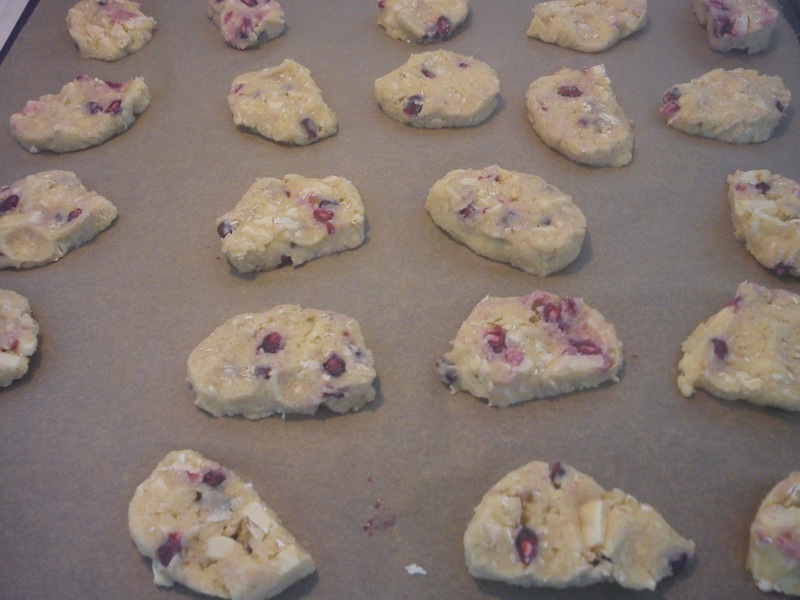 Break the white chocolate into smaller pieces and stir them and pomegranata kernels into the cookie dough. Wrap the cookie dough in cling film. 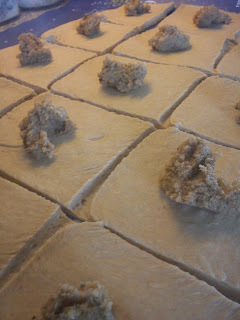 Let the cookie dough rest in the refrigerator for minimum 1 hour or night over or place it in the freezer for ½ hour. Shrovetide bun are connected with fasting, which starts 49 days before Easter. And in the fast you are not supposed to eat meat and wheat flour as well as not drink milk or alcohol. 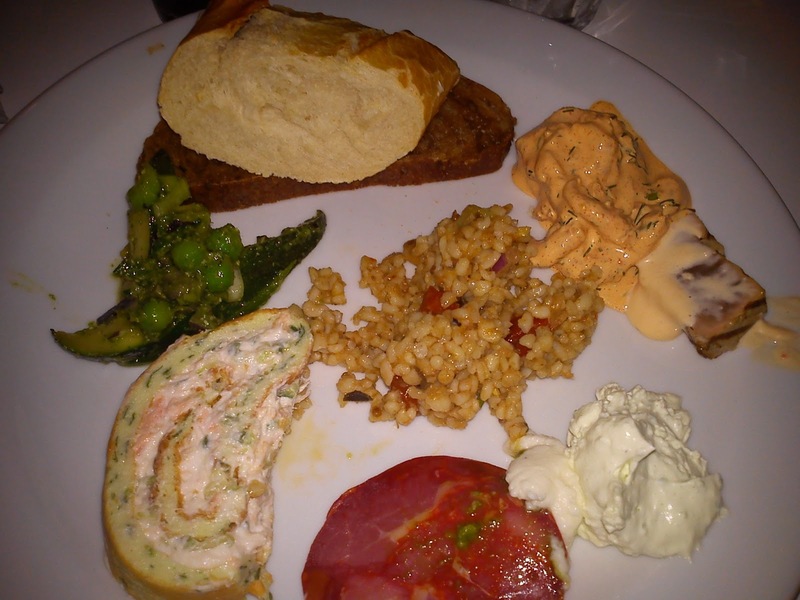 So before the fast started there was big parties, where you would indulge in these foods. 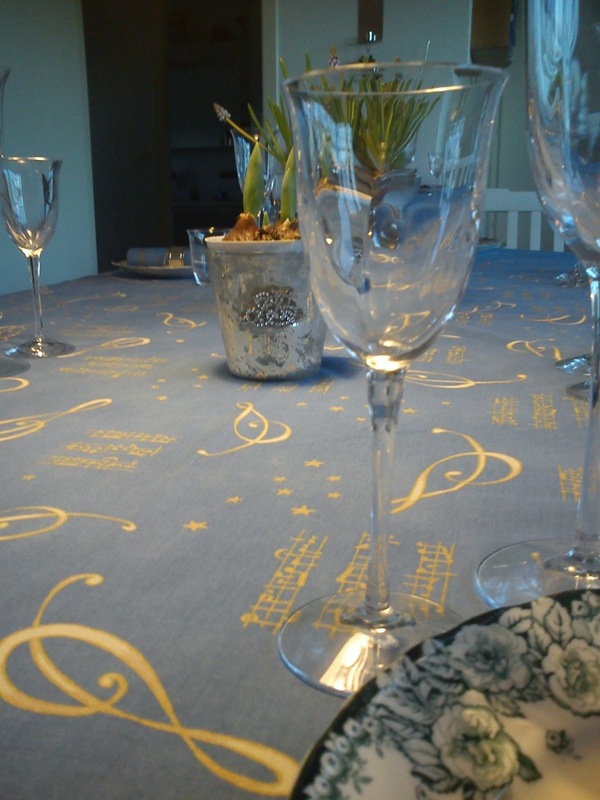 Fastelavnssøndag (Shrovetide Sunday) and the following Monday were the last days, where you could eat meat. 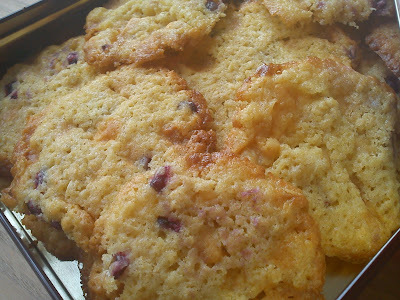 The following Tuesday was the last day of eating wheat flour, where here buns were baked and eaten. This White Tuesday is also known as Pandekagedagen (Pan Cake Day) again relating to the use of wheat flour in pan cakes. Another funny thing is, that I noticed the very first advertisements for buying Shrovetide buns in the local news paper right New Year. 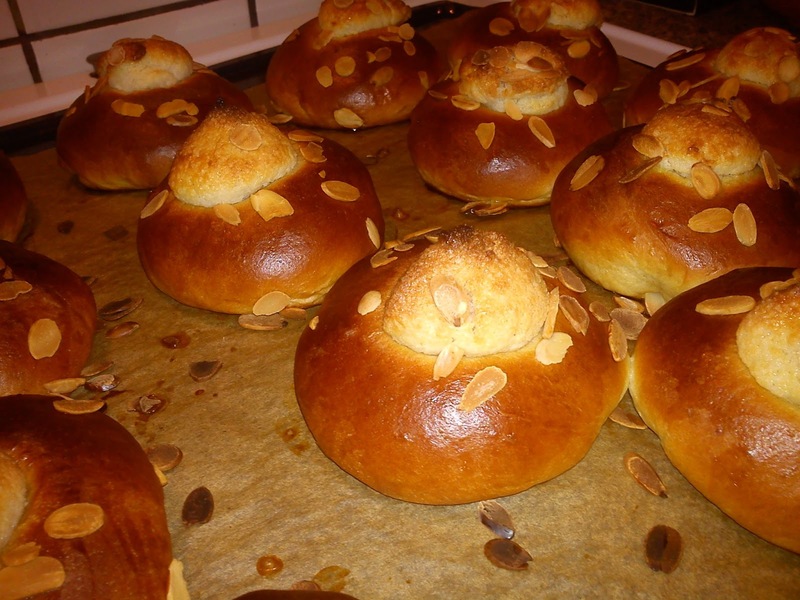 There is 6-8 weeks from New Year to Shrovetide, but it has been possible to fill your stomach with Shrovetide buns from the bakers in many last weeks. 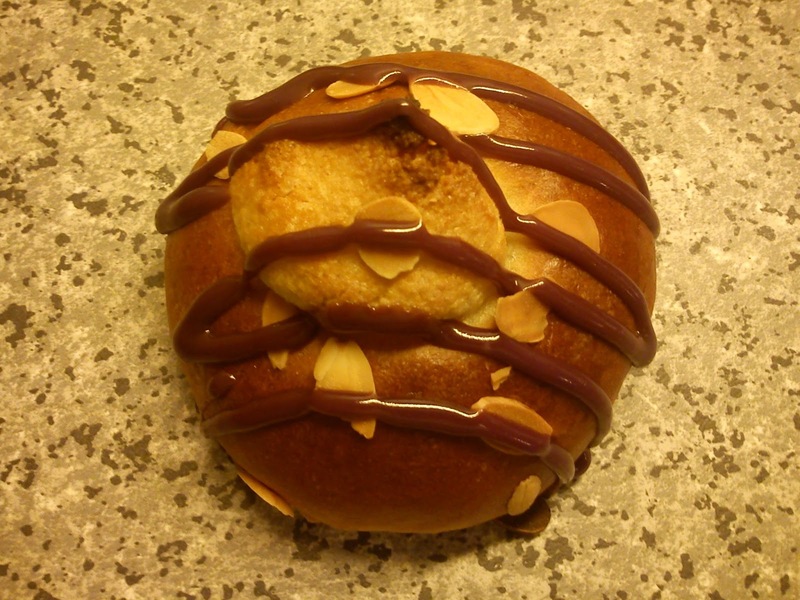 Here is an interesting article about Shrovetide Buns (in Danish). However, the taste of Shrovetide buns from the bakers are nothing compared to your own home-made buns, where you can adjust the filling to your personal taste preference. In case you have become mouth watering I will been this blog post with a few recipes on Shrovetide bun, as this is the very last you can eat wheat flour, if you are fasting before Easter ! 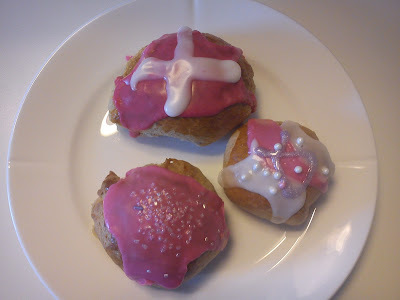 Last year I got a request from one of my good blog readers, that she would "like to have" a recipe on Shrovetide buns with liquorice, so I took a tour out on google looking for a recipe on Shrovetide Buns with liquorice, where I decided to bake this one fastelavnsboller med lakrids from Samvirke. I have the following modification on the original recipe. Being a liquorice fan (natural trait of being Danish) I decided to give it full power with liquorice, using a combination of English liquorice powder and raw liquorice powder. I also decided to add a little lemon zest in to the bun filling. And finally I have removed the vanilla sugar from lemon icing. Wauuw, this is a Fastelavnbolle for connoisseurs. 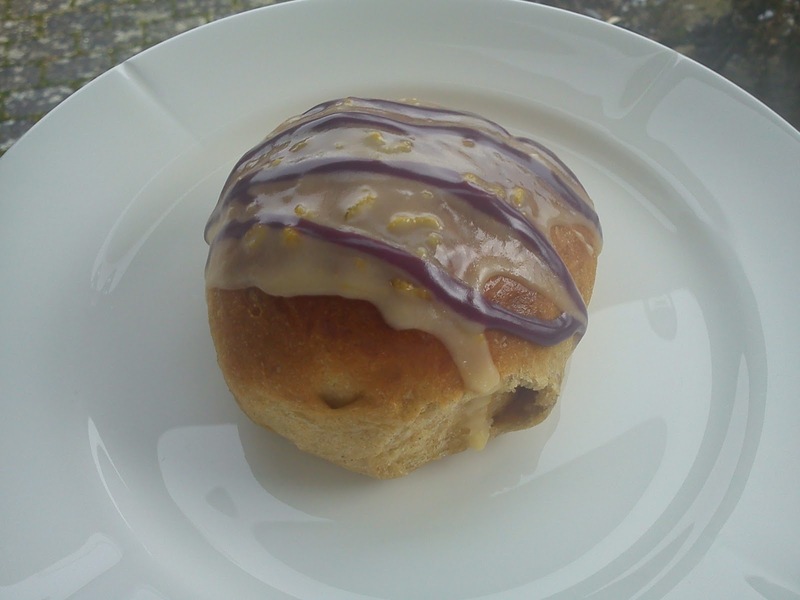 The very first impression you get is a sweet refreshing lemon flavour from the icing, as you bite longer and longer into the Shrovetide bun the power of liquorice kicks in - uuhmmm. So here my good blog reader from Estonia is your request from last year being fulfilled incl my little purple twist on the lemon icing. 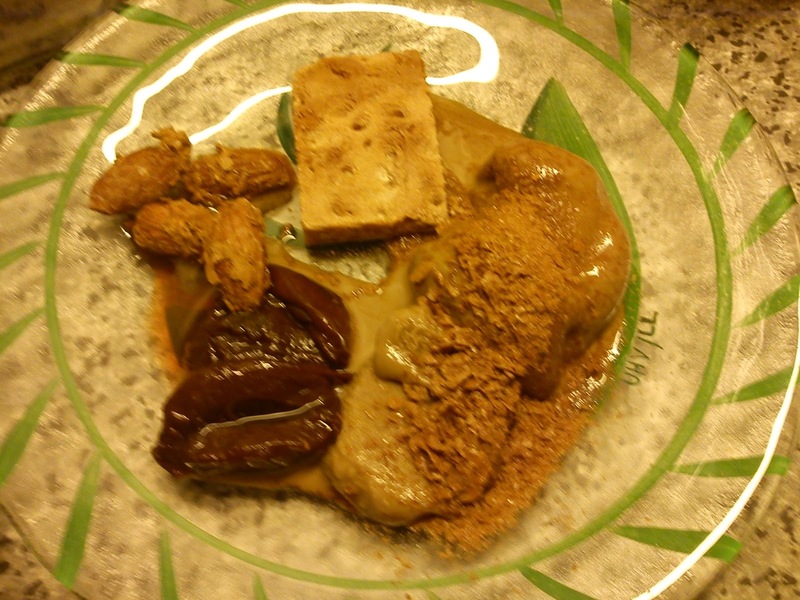 Mix butter, dark syrup, cardamon and milk in a cooking pot. Let it heat up, until the butter is melted. Pour the liquid into a mixing bowl and let it cool down until it is finger warm. Add the egg into the liquid, followed by the yeast, stir well. Finally add the salt. Add the wheat flour. Knead the dough together, I usual knead for 10 minutes. Mix marzipan, butter, sugar and liquorice powder together to a homogeneous mass. 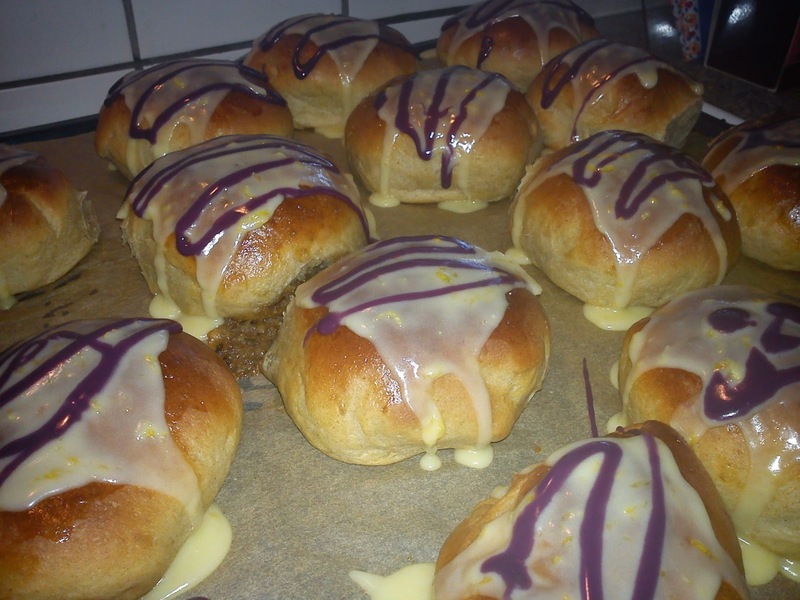 Cool down the buns before decoration with lemon sugar icing. 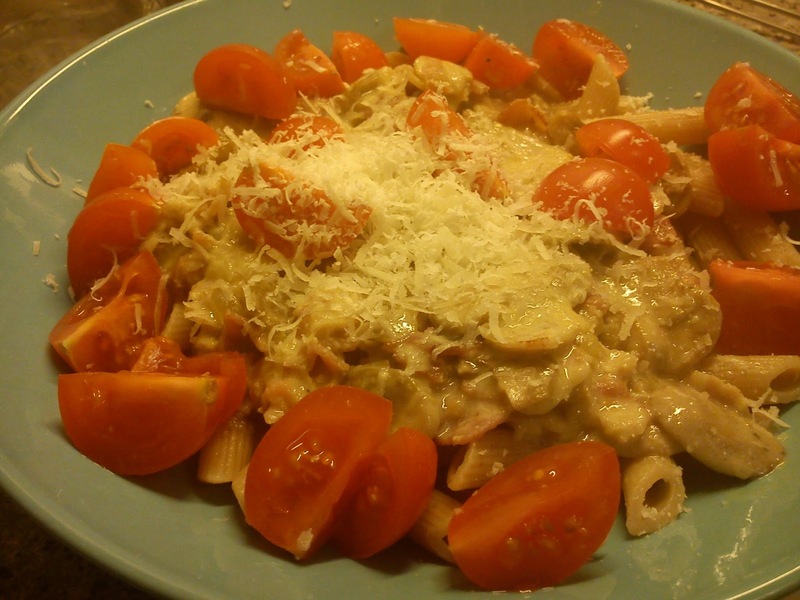 Pasta dishes are among my favourite dishes, so this time I am sharing a recipe on Penne Carbonara with you from my little kitchen. 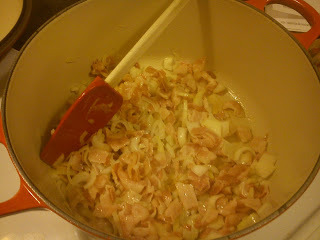 Start by frying the bacon pieces in a big cooking pot. 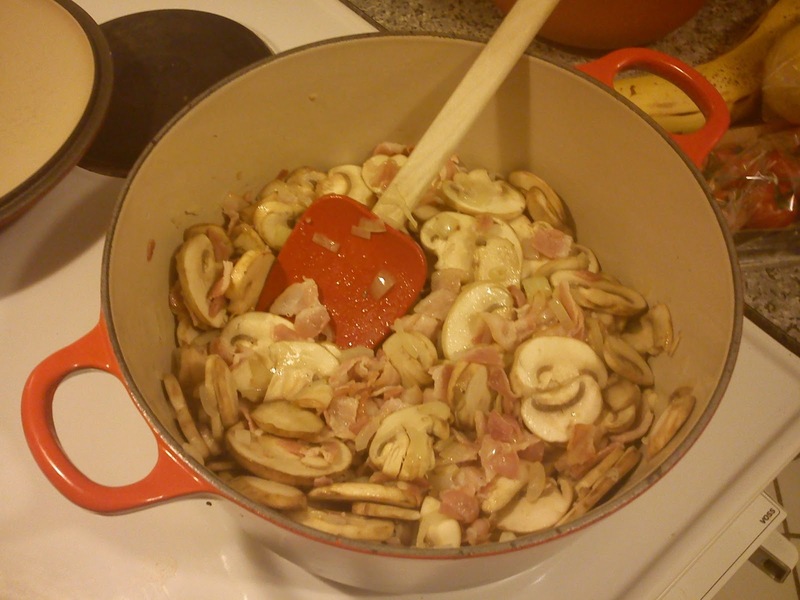 When the fat from the fat is melted from the bacon add in the onion and mushrooms. Let is fry for 1-2 minutes. 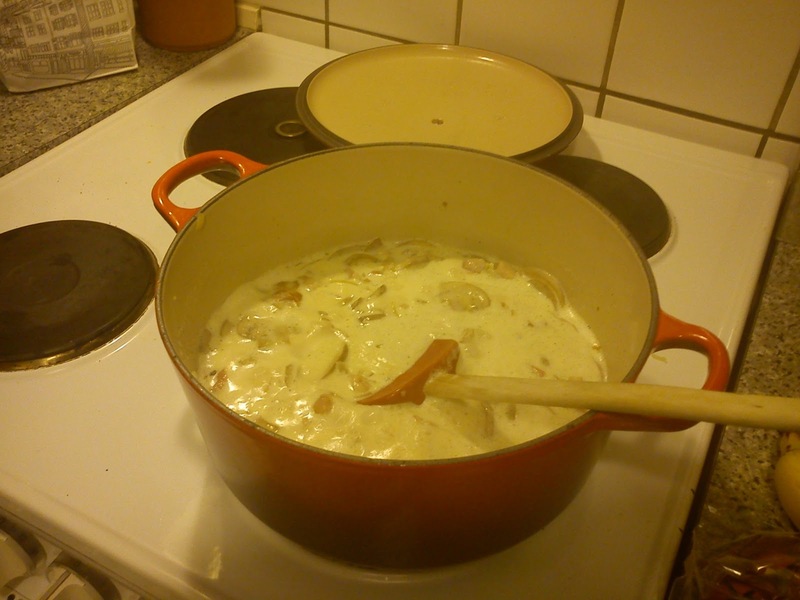 Add the herb stock paste, cream and water. Let it boil softly for 10-15 minutes. Meanwhile cook the paste penne for 8-10 minutes. Season the paste sauce with salt ans pepper. Drain the pasta, add the carbonara sauce, sprinkle with Parmesan cheese and decorate with cocktail tomatoes slices in smaller pieces. Two weeks ago I was on a quick trip in England together with my mother. It was actually a part of my Christmas present to her. We started the tour Tuesday in Esbjerg, where we boarded the boat. The boat sailed off at 18.45 on it´s journey across the North Sea to Harwich, where we arrived at 12.00 Wednesday. Here we were transported by bus to Colchester, where we had 3 hours for our power shopping. The boat sailed off again 17.45 from Harwich and we were back in Esbjerg Thursday at 13.00. I had my little shopping trolley with me, so I did not have to carry all the various shopping getting longer and longer arms. 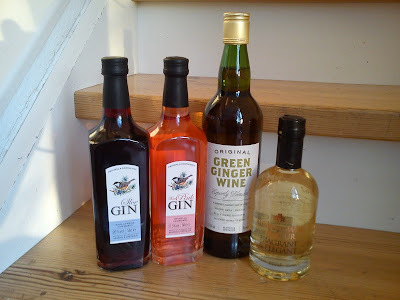 a bottle of sloe gin - I have an ambition about making my version home-made version of sloe gin. a bottle of cranberry gin - as the colour very appealing. This tomato soup with cream is having a great creamy taste and texture being another type of Winter comfort food. If I have any leftovers of dairy cream from other food activities in my kitchen, I will be placing those smaller portions of ½-1 dl dairy cream in small containers and placing them in the freezer. Many times, when you need dairy cream for a portion of soup, you can easy pick out the right amount of containers with cream from the freezer. Fry the onions in the hot oil together with the Sonnentor Hot Stuff in a larger cooking pot. 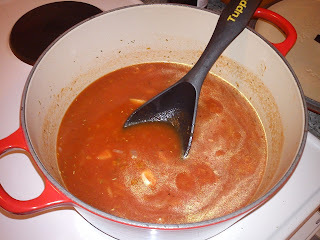 Add mashed tomatoes, water and Herbamare vegetable stock into the cooking pot. Let everything softly for 20-25 minutes. Meanwhile cook the soup pasta horns in a separate cooking pot, so they do not pick up water from the soup. 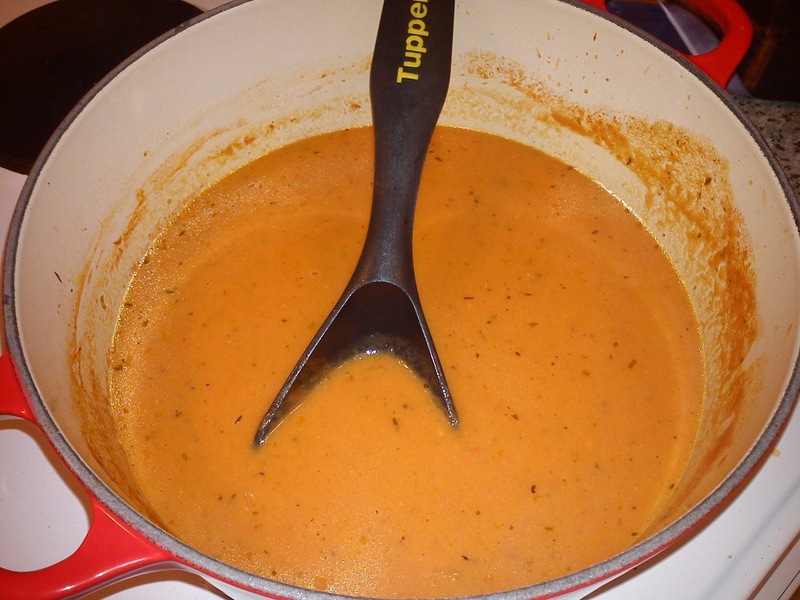 Blend the soup and add in the cream. Let the soup cook for another 5 minutes. 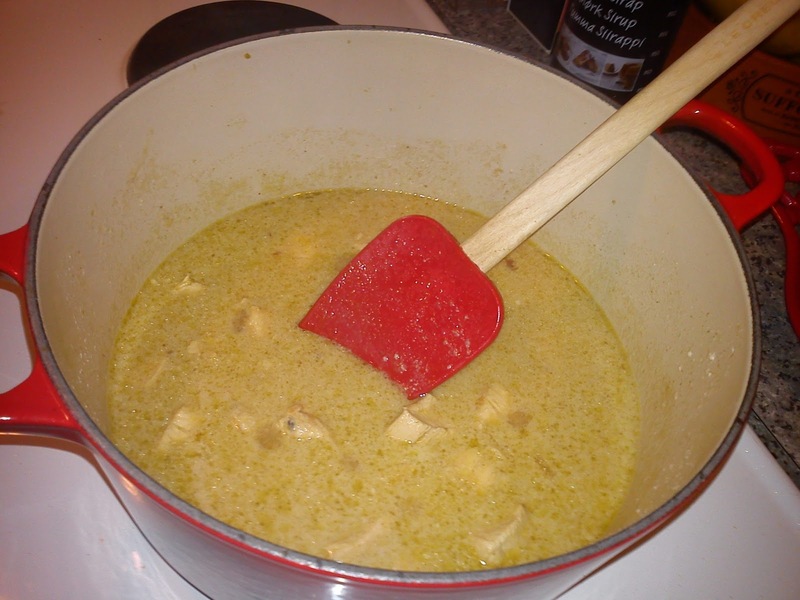 Add the soup paste horn into the soup. Next Sunday is "Fastelavnssøndag" here in Denmark, so it is time for me to try out some new recipes on "fastelavnsboller" (Shrovetide buns). The very first recipe, which I will be testing out in my little kitchen are these fastelavnsboller med kransekage from Odense Marcipan. 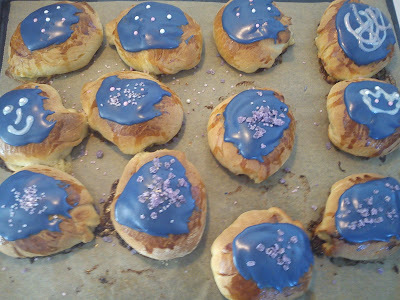 However, I have made a few changes in form of reducing the amount of yeast, addition of vanilla sugar into the bun dough and exchanging the chocolate icing with purple muffin icing from Germany instead of. Otherwise I have sticking to the recipe incl. using the product called Odense kransekage, which costs 45 DKK for 400 g. Here I must admit, that I feel ripped off, when I looked into the ingredient list at home in my kitchen. 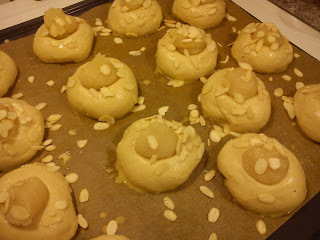 For me kransekage (marzipan cake) means something, which contains a lot of marzipan !!!! The ingredients list for this specific product was (in falling order): sugar, apricot kernels, egg white, almonds (7%), glucose syrup and starch !!!!!! If I bake these fastelavnsboller another time, I will be making my own marzipan cake filling of only marzipan, icing sugar and egg white. Melt the butter in a cooking pot, add the milk. Remove the dairy liquid from the cooking pot, when the temperature is warm without being to hot. Add the yeast into this dairy liquid, stir well until the yeast is dissolved. Add the vanilla sugar, salt and sugar. Stir until everything is dissolved. De-gas the dough and weigh the dough into 80 g pieces and form a bun. 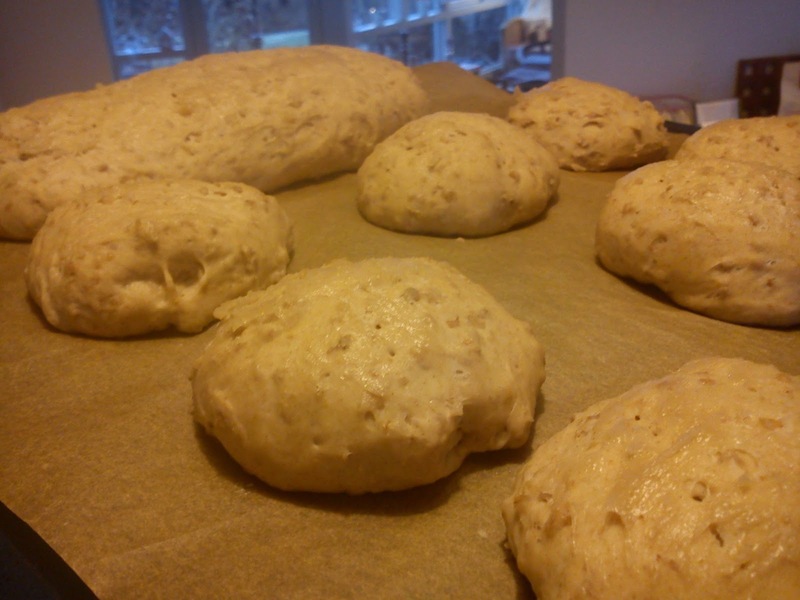 Place the buns on a piece of baking paper. Let the buns raise for 45-60 minutes. Heat the oven to 225'C (conventional oven). Make a hole in the bun dough using your fingers. Fill the hole with the Kransekage filling. Glaze the bun with whipped egg and water. Afterwards add almond flakes. Place the buns in the middle of the hot oven. Bake the buns for 20 minutes. Let the bun cool down, before they are decorated with purple muffin icing. Yesterday evening the annual Fish Dinner Evening for rowers took place. This year we all meet up in my kitchen living room. All are participating in one way or another either by bringing a fish dish or by bringing some bottles of white wine. We have no idea how the actual menu will look like before we actually meet up, as the only coordination is, if you will bring a fish dish, dessert or wine. And as usual we all decided to have a similar event in one year´s time in 2014. As starter we got soup made on tomato, cream, garlic, peach and with scrimps being the fishy part of this dish. 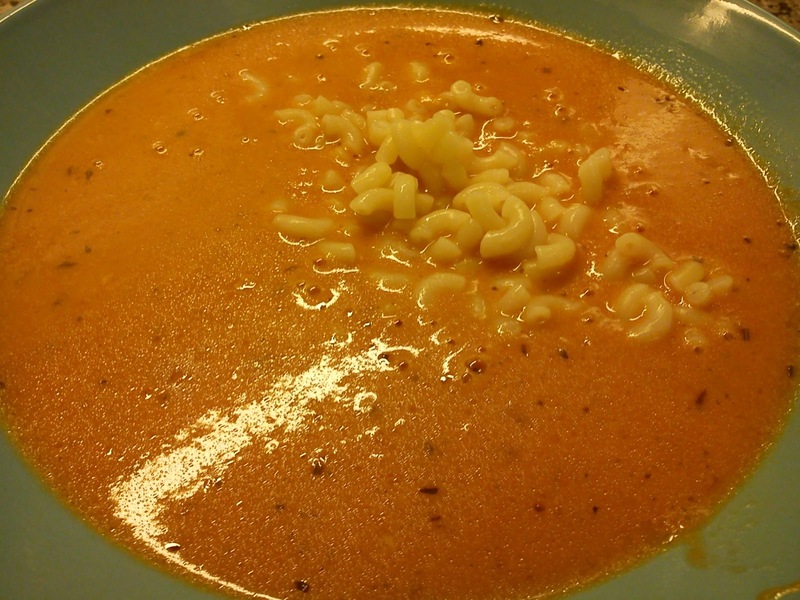 Uuuhmm, perhaps I should make and share this specific soup with you at later stage ? 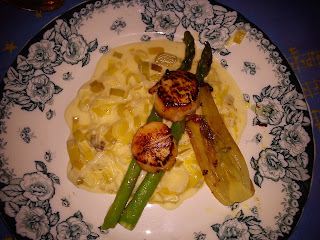 The second dish did also contain scrimps, this time in form of a pie made from filo dough. 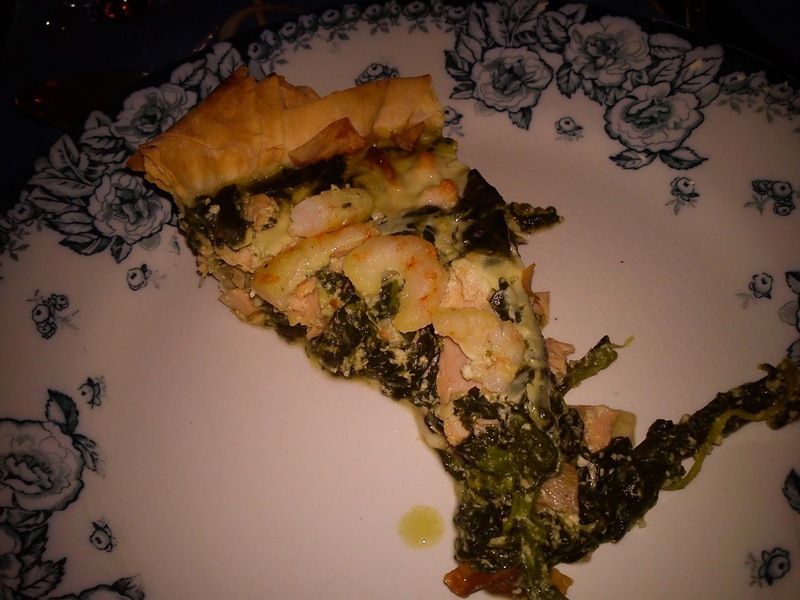 And the flavouring giving part of the filling was spinach and scrimps. 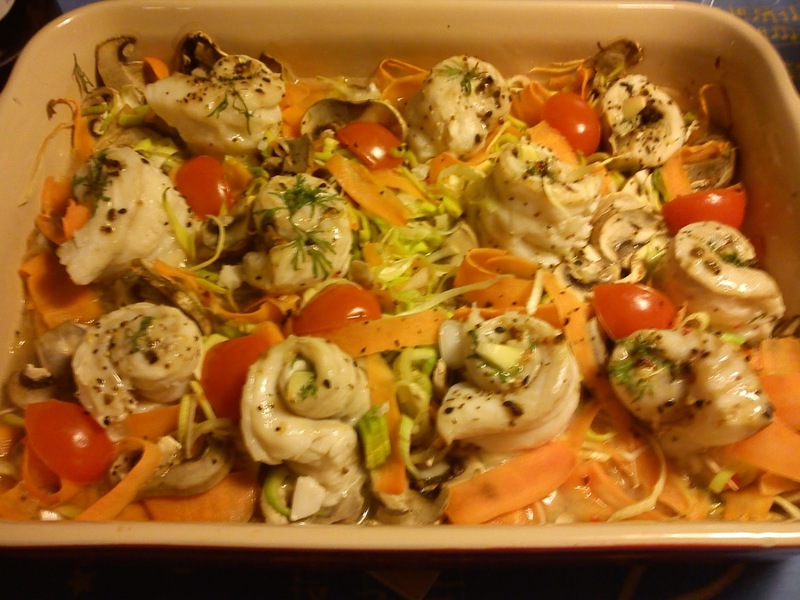 The forth and final fish dish was cod prepared in the oven on a layer carrots, tomatoes, mushrooms and leak, which was cooked in a sauce made from white wine. So plenty of colours for your eyes. 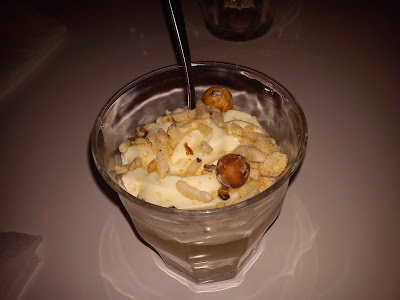 As the final finishing touch I served a dessert symphony of home-made liquorice ice cream, plums in port, roasted liquorice almonds and finally a cookie from Läckerli Huus. 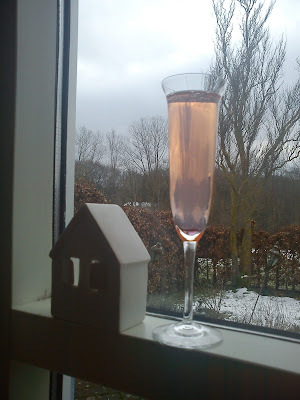 As the liquid part the guests decided to chose a glass of blackberry rum. 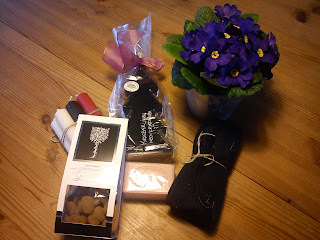 Besides from that all the guests were bringing the majority of the food and wine I also got some lovely hostess gifts in form a primrose, a liqueur with spices, liquorice almonds from Summerbird (uuhhmm), candles and soup. A big thank you to my guests for the lovely gifts.